She remarked that I already had done it. 🙂 I guess I had. And after yesterday am still working hard toward that goal. The early morning tranquility of the dining room. But the fiber is slowly and steadily encroaching. Completed! 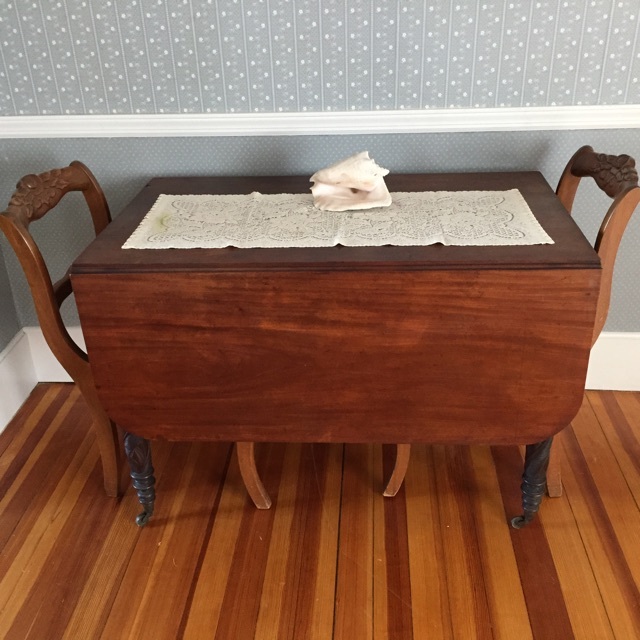 No fiber or furniture was harmed in this takeover. 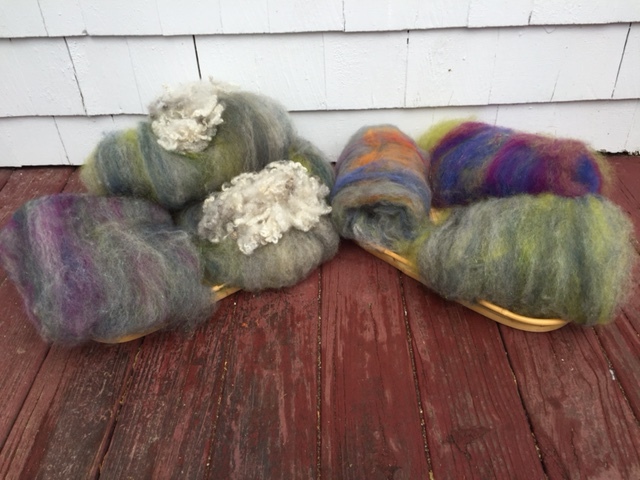 Christine and I are making batts to sell and yesterday I loved having everything around me to pick and choose. 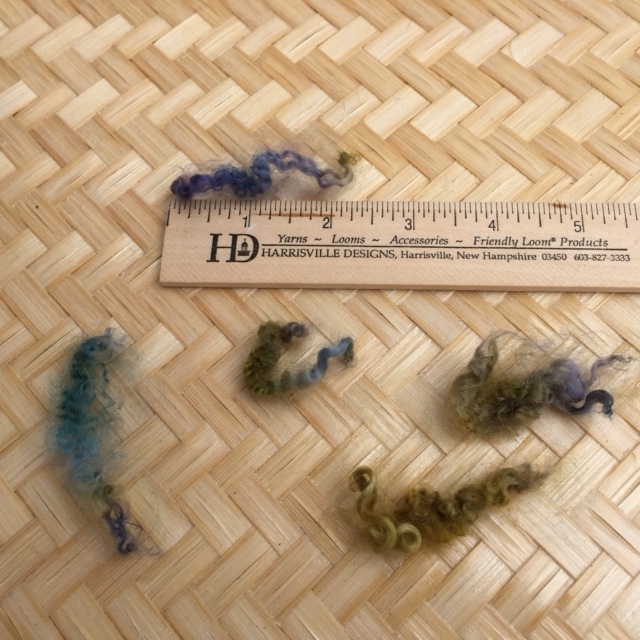 More dyed fiber troops did arrive as the day went on and my enthusiasm kept on increasing. If that is possible. Remember Henna the Gulf Coast before she was dyed? Gulf Coast Henna before she was dyed. These are the batts made so far. 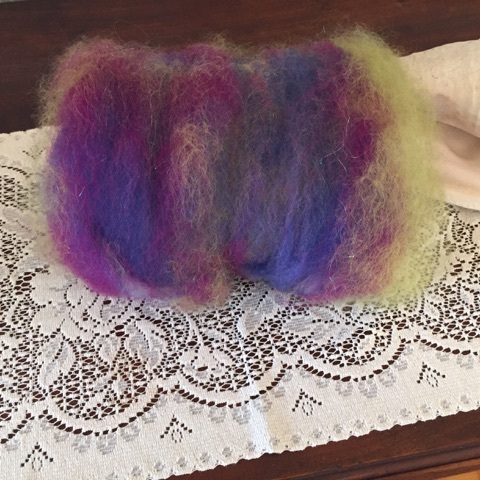 I put Josie the Bluefaced Leicester locks on top of two batts that will go into boxes full of a variety of spinning fibers that we will be selling. I kept it there for the picture because it reminds me of our latest tv obsession, Broadchurch, seen on BBCAmerica. It takes place in today’s Great Britain and in the courtroom scenes the judge and lawyers wear traditional small white wigs on top of their regular hair. Kind of the George Washington style but smaller and perched on the head. Kind of like the locks in my picture. Which brings me back to the wonderful and adorable Bluefaced Leicester sheep. 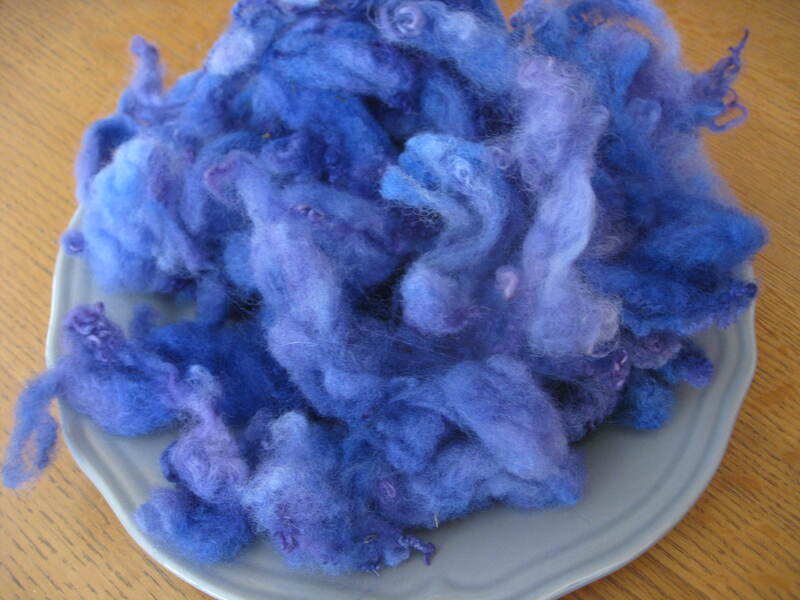 I don’t know a single spinner who isn’t crazy about Bluefaced Leicester (BFL) fiber. The locks are just so darned cute. Here are some lamb locks I dyed. They are short, bouncy and have the sweetest little curls. I am not going to use these locks for anything except adoration. 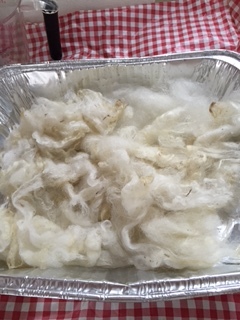 BFL sheep typically have fleeces that weigh between 2 1/4 and 4 1/2 pounds. The lock length is 3-6 inches. Mine shown here is shorter as it was a lamb’s fleece. Her adult fleece would be longer. The individual fibers from an adult fleece are measured to be 24 to 28 microns. The reason a non-math spinner like me avidly follows micron counts is because they correlate with scale of soft to coarse feel of the fiber. 21 is considered to be the highest count that many would find comfortable next to the skin. It is a general term because people vary in the way they perceive fiber. Millie’s lamb fleece is probably softer than 24 microns because lamb’s fleeces are softer. I am not interested in micron count because I always want soft wool. I don’t always. I have lots of uses for coarse wool too. Micron count helps me to better understand the fiber as a whole. 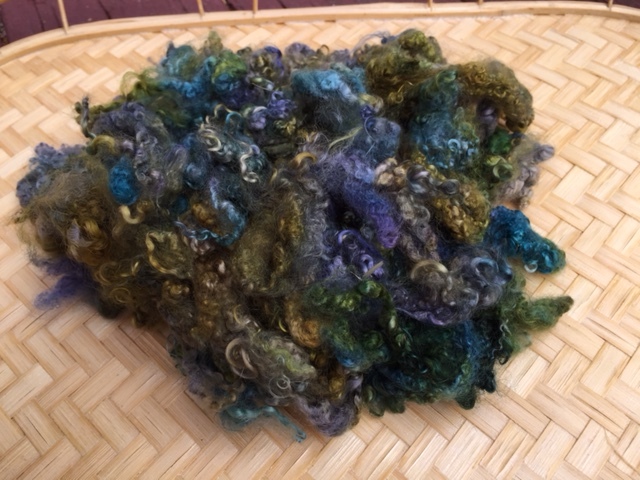 BFL has a nice shine to it (luster) and as pictured above, takes dye well. Since the locks are so bouncy and curly they are best first picked open. I sometimes pick them apart with my fingers but usually give them a few strokes with my hand cards. 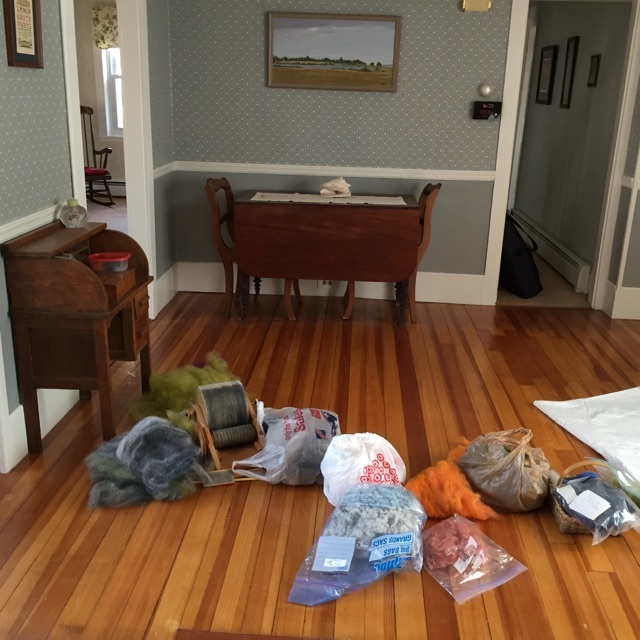 More on processing/spinning BFL next week. 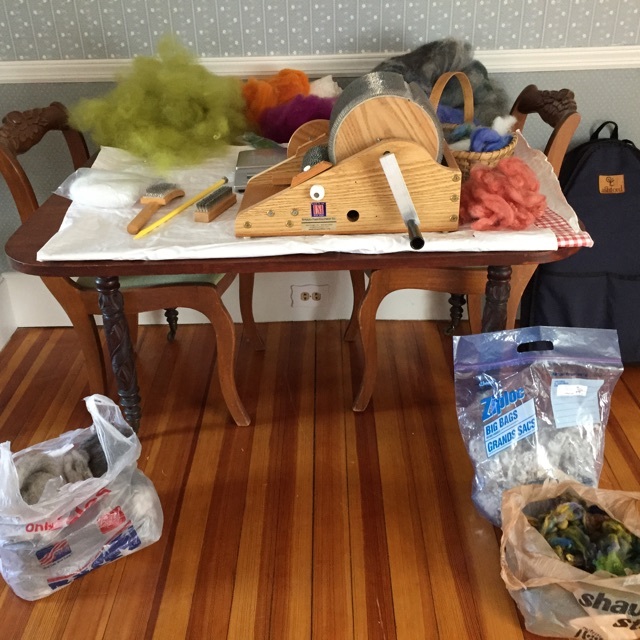 This entry was posted in Uncategorized and tagged Bluefaced Leicester Sheep, Bluefaced Leicester sheep wool, colorful wool, colorful wool batts, drum carded batts, fiber spinning, Gulf Coast sheep, Gulf Coast sheep wool, hand dyed wool, hand dyeing, handspinning, lamb's fleece, Tumble Creek Farm, wool batts on April 14, 2015 by Betsy Alspach.